RS Agri brought working prototypes of their new range of cubicle brushes, designed and built in the UK, to the market in late 2011. All machines have the CE approved mark. They have been working on various farms achieving excellent results with good feedback from customers. The machines have been specifically designed to cope in UK conditions and have been built to a high end specification. This improves hygiene and helps prevent bacteria build-up. In addition the combined sweeper/bedder offers savings in bedding materials used. A simple self-propelled brush to eliminate the need for brushing cubicles by hand. With variable hydraulic drive, the Rapide Brush is easy to use, compact and manoeuvrable. See before and after shots showing the use of the hydraulic scraper option on the RS Rapide Brush (on farm in Chumleigh, Devon). Cleaning both sides of the passageway is an added bonus whilst the brush is sweeping the mattresses. The self-propelled machine performs at a consistent level leaving the cubicles clean and applying an even amount of bedding material. 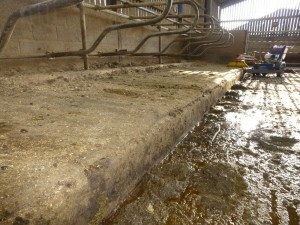 Less bedding material is used so saving more money. The overall cleanliness of the cubicle area means improved levels of hygiene. The RS Rapide Combi offers a simple solution to the problem of keeping cubicles clean and bedded with fresh material in a one-pass operation. Designed, built and tested in Devon the Ride-on Rapide Combi has all of the standard Combi features with extras – and all the comfort of operation from a seat! The machine is powered by a 9hp Kubota diesel engine and is hydraulically driven through a differential axle. 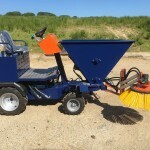 There is full hydraulic operation for the brush and it can sweep up to 950mm into the cubicle. An hydraulic operation slide regulates the amount of bedding material applied. The turning circle is tight and it is easy to manoeuvre due to the power steering. 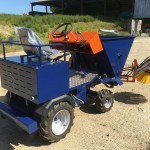 Attention to making the machine accessible for regular servicing and sound engineering throughout the build means that it is suitable and reliable for everyday use on the farm. Time saving, material saving and good for the operator, it does the job well. 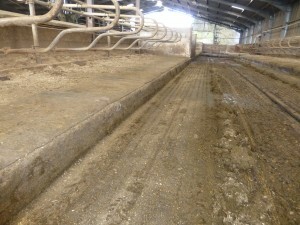 This tractor/telehandler mounted brush can be used to sweep cubicles clean for better hygiene and animal welfare. It can be operated with just one hydraulic service. 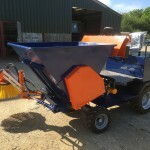 This tractor/telehandler mounted implement can be used to agitate and level out sand or green waste bedding material in cubicles giving greater comfort to the cows. For good visibility when using a loader, the rake works on the left side and for easy transportation when not in use, the attachment is very low.